"99% of the Time" is not "Always"
Defendant's motion for summary judgment of noninfringement was granted. "[T]he Court now finds that the applicants’ unequivocal statements in the prosecution history, made to distinguish prior art, in conjunction with the strong specification language, amount to a clear and unambiguous confirmation that the [patent-in-suit] requires that the claimed method always be performed, and thus does not encompass an accused system that only practices the claimed method some, or even most, of the time. The word 'never' is one of the strongest and most unequivocal words in the English language, and [plaintiff] used it (and its equally strong antonym, 'always') repeatedly in explaining its invention in the specification and prosecution history. . . . [Plaintiff's arguments] essentially admit that [the accused product] does not always write full stripes to empty logical tracks. Even taking the evidence in the light most favorable to [plaintiff] and assuming that [accused product] does so 99% of the time, 99% is not 'always.'" "Offer to Sell Liability Does Not Apply to Claims of Infringement of a Method Patent"
Plaintiff failed to state a claim of indirect infringement of the asserted method claim because the complaint lacked any allegation of underlying direct infringement by a third party and defendants' "market[ing] their products with the intent that they be used to infringe" did not constitute an "offer to sell." "The Federal Circuit has on two occasions specifically declined to address whether a method patent . . . can be infringed pursuant to the 'offer to sell' clause . . . . [A]lthough there are apparently divergent views on this issue among the district courts, this Court is persuaded that 'offer to sell' liability does not apply to claims of infringement of a method patent. The Court concludes that in this case, in order to state claims for indirect infringement, [plaintiff's] complaints must plead specific facts plausibly establishing that direct infringement of the [patent-in-suit] has occurred, i.e., that a third party has actually performed each step of the patented method." Federal Circuit's En Banc Review of Written Description Requirement Does Not Constitute "Intervening Change" or Alter "Existing Standards"
The court denied in part plaintiff's motion for judgment as a matter of law of no invalidity for lack of written description on the basis that "35 U.S.C. § 112, paragraph 1 . . . does not contain a written description requirement separate from an enablement requirement." In a pre-verdict motion for JMOL, plaintiff argued that defendant's evidence failed to establish a lack of written description, but plaintiff did not argue that the written description defense lacked merit because "§ 112 does not contain a written description requirement." Moreover, an expected en banc decision by the Federal Circuit did not constitute an "intervening change in the law" such that the failure to raise such argument was justified. "It is the court’s opinion that an expectation of change does not constitute an intervening change. . . . The court recognizes that the Federal Circuit has heard oral argument in [Ariad Pharms., Inc. v. Eli Lilly & Co., Fed. Cir., No. 2008-1248 ] and that the Federal Circuit’s forthcoming decision in that case may alter the scope and purpose of the written description requirement. However, this court. . . is constrained to follow existing standards under Federal Circuit law, and Federal Circuit precedent 'clearly recognizes a separate written description requirement.'" The court granted defendant's motion to limit damages to the period of time after the PTO issued a certificate of reexamination for the asserted patent claiming a potassium bromate replacement used in commercial bread-making. Plaintiff's amended claims using the transitional phrase "consisting of" were not substantially identical to the original claims which used the transitional phrase "consisting essentially of." Defendant's motion to dismiss for lack of subject matter jurisdiction was granted. "[Plaintiff is] basing its arguments in support of this court’s jurisdiction on the defendant’s actions directed towards [its] customer, rather than [plaintiff] itself. However . . . there is no ongoing litigation between [plaintiff's customer] and [defendant]. Thus, the court finds that the defendant’s actions directed at [plaintiff's customer] do not constitute a real and immediate injury for Article III jurisdiction." Claims Containing "Control Means" Element were Indefinite for Failing to Disclose "Steps of an Algorithm Executed by the Microprocessor"
Defendants' motion for partial summary judgment of invalidity for indefiniteness was granted in part as to claims containing the term "control means." "[I]f the specification merely states a computer or microprocessor performs the claimed function, the specification does not disclose adequate structure and the claim is indefinite. Similarly, the specification does not disclose sufficient structure if it simply describes the outcome of the claimed function and does not disclose a computer programmed to execute a particular algorithm. . . . [Plaintiff's] two steps accurately follow the written description as to the generalized way the control means operates, but those steps are not the steps of an algorithm executed by the microprocessor. Any algorithm would necessarily take the form of a sequence of steps where the existence of a varying voltage drop across resistors . . . would be determined or inferred." Defendant's motion to limit the number of plaintiffs' claims was denied. "Defendant contends that it is suffering prejudice because Plaintiffs have refused to cull the number of claims they are pursuing prior to the commencement of the claim construction process. . . . The Court does not intend to impose an arbitrary limitation on the number of claims Plaintiffs may pursue. While it would encourage Plaintiffs to cull the claims as soon as practicable in order to prevent the expenditure of the resources of both the Court and the parties, it does not intend to preclude Plaintiffs from pursuing claims that, once relinquished, cannot be pursued in future." Disqualification of Counsel in Patent Case Requires "Factual Analysis," Not "Automatic Disqualification Rule"
The court sustained defendants' objection to the magistrate judge's order disqualifying their counsel. "[P]atent cases are more likely to involve intensely complex, specialized issues that require experienced, knowledgeable counsel, and mandatory disqualification may work prejudice to a party by depriving it of its counsel of choice. As such, mandatory disqualification may serve to encourage the use of disqualification motions solely for tactical reasons -- a use courts have repeatedly expressed concerns about. . . . [T]he Court finds that the Magistrate Judge, by applying an automatic disqualification rule, failed to undertake the necessary factual analysis and weigh the relevant factors before disqualifying [defense counsel] from representing [defendant] in this case. As such, the decision is erroneous and shall be set aside." In granting defendant's renewed motion for a stay pending reexamination, the court rejected plaintiff's claim that "it will be irreparably harmed if a stay is granted because [defendant] continues to release products that use . . . the accused product to the open source community on an ongoing basis. . . . The Court has . . . found it telling that [plaintiff] had not sought an injunction and waited nearly three years after [defendant] announced [the accused product] and two years after its release to file suit." The court rejected defendants' argument that a claim element construed to require "receipt" of certain data could not receive such data from itself. "[Defendants] argue that 'where one element . . . must receive data from another element . . . the two elements cannot be identical because one must provide data to the other' . . . On balance, [defendants] have not shown any limitation that an accused element cannot receive something [data] from itself. The Court expressly rejects [defendants'] proposal that the claims be interpreted or construed in such a manner." Defendant was entitled to summary judgment on its inequitable conduct claim where plaintiff (i) amended its claims to overcome a rejection by adding a claim element, (ii) failed to disclose the most relevant prior art with respect to that element, and (iii) failed to provide a credible explanation for the withholding. "[A]n inference of intent is supported not simply by the lack of a credible good faith explanation for the nondisclosure, but also by independent evidence of a far more substantial factual basis, namely that Plaintiff actually made an argument in favor of patentability that contained, as the primary distinguishing element, a feature that was not disclosed in any of the prior art before the examiner and that was readily apparent in the undisclosed [prior art device and manual]. As Defendant correctly emphasizes, Plaintiff 'went beyond merely silently failing to disclose the [prior art device and manual] as a general reference'; rather, he 'affirmatively made misrepresentations by failing to disclose the closest, highly material reference which went to the critical point of patentability [i.e., the mounting portion/cam roller limitation] which [plaintiff] relied upon to obtain the [patent-in-suit].'" For purposes of the on-sale bar, a cookies-functional web browser was "ready for patenting" prior to the critical date of the patent-in-suit. Even though the web browser was not released until after the critical date, the evidence showed that the inventor "logged a draft of the http cookies source code into the Netscape source code repository prior to [the critical date]." "[I]t is well settled that the [Pfaff v. Wells Elecs., Inc., 525 U.S. 55 (1998)] test may be satisfied despite the patentee's continued refinement of the invention. Accordingly, where, as here, the undisputed record evidence shows that draft cookies source code existed [prior to the critical date], the second Pfaff prong is satisfied. Moreover, with respect to inventions involving computer code, Pfaff simply requires complete conception of the invention, not the source code's actual completion, provided that there is an enabling disclosure that would allow one skilled in the art to complete the invention." The court granted plaintiff's motion to preclude evidence of defendants' new obviousness defense based on the combination of prior art references. The prior art references were disclosed individually in defendants' discovery responses and expert reports, but not in the combination asserted in defendants' summary judgment motion. "The Court finds the defendants’ expert report to be wide ranging in listing bases for the defendants’ obviousness defense. As such, the absence of the [specific combination asserted in summary judgment] in this and all other documents that preceded the defendants’ motion for summary judgment is notable. The defendants had every opportunity to raise obviousness defenses during discovery and in fact did so. The Court views the defendants’ failure to timely raise this particular defense as a waiver, and grants the plaintiff’s motion to preclude on this issue." 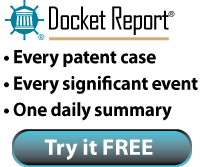 Try the Docket Report today for free. No strings attached. No pushy sales. And we’ll NEVER share your email address. Click the link in the top right of this page to send a request. In granting plaintiff's motion for summary judgment on defendant's inequitable conduct counterclaim, the court rejected defendant's argument that plaintiff misled the PTO in certain arguments favoring patentability over the prior art. "The Federal Circuit recently stated that 'our precedent has made clear that an applicant is free to advocate its interpretation of its claims and the teachings of prior art' . . . The court pointed out that since the prior art reference had been 'submitted for the patent examiner to examine herself, she was free to accept or reject the patentee’s arguments distinguishing its invention from the prior art.'" The magistrate judge recommended denying defendant's motion to dismiss plaintiff's declaratory relief action for lack of subject matter jurisdiction where plaintiff's suit was based upon an allegedly confidential email between defendant and a third party. "There is nothing inherently confidential about a statement accusing a third party’s product of patent infringement. [Defendant] should reasonably have anticipated -- and perhaps even intended -- that its claim of infringement by [plaintiff's] product would be communicated to [plaintiff]. . . . The communication was an affirmative act fairly traceable to [defendant]; the fact that the email was marked 'confidential' does not affect the justiciability analysis." In granting in part defendant's motion for attorneys' fees under § 285, the court found that defendant's earlier offer to settle merited an award of fees. "The Court also considers the tactics of counsel. Despite considerable evidence that it had not infringed, [defendant's pre-summary judgment] letter also included an offer of settlement. There is no evidence [plaintiff] entertained negotiations. These divergent tactics, commendable on [defendant's] behalf, support an award of fees . . ."
The court denied plaintiff's motion for judgment on the pleadings as to defendant's inequitable conduct claim based on the theory that plaintiff buried relevant prior art among 597 other prior art references. "Defendants have sufficiently alleged with particularity that [plaintiff's] prosecuting attorney . . . filed [two IDSes] in connection with the prosecution of the . . . patents that contained approximately 598 prior art references in which [plaintiff] failed to identify the relevant prior art pertaining to invalidity. . . . Further, [defendants] allege that the PTO examiner specifically requested a clarification or explanation of the prior art references, and thus sufficiently allege with particularity the materiality of submitting a 'mountain' of prior art. Last, Defendants sufficiently allege that [plaintiff] intended to deceive or mislead the PTO during the prosecution of the . . . patents because it submitted a mountain of largely irrelevant material to the PTO examiner and then failed to inform the PTO examiner which material was relevant, and, in the case of [one] patent, submitted no IDS at all." In concluding that one of ordinary skill in the art would be motivated to combine the teachings of a prior art betting system with the teachings of a prior art banking system, the court found a suggestion to combine where the betting system stated that its “voice response unit can be applied to other fields" and listed potential applications, including "credit card checking" and "deposit balance information." The court rejected plaintiff's argument that the "urgent time pressures" associated with "[the] betting system . . . are not present in a remote access banking system." "The question is not whether the specific implementations described in [the two prior art systems] can be seamlessly integrated. When dealing with different applications like betting and banking, problems would undoubtedly result from combining those implementations. Such facts do not tend to show that particular features from each reference should not be combined for the purposes of determining whether a disputed claim is obvious. The correct question is whether a person of ordinary skill in the art would be motivated to combine the specific elements from the references that would result in the claimed invention. . . . [Here the betting reference] provides an express suggestion to combine [its] technology with financial applications like [the banking reference], and any problems associated with combining specific implementations do not teach away from the claimed combination." In addressing the parties' dispute as to whether the court's order granting a preliminary injunction (upheld on appeal) was admissible to establish willfulness under In re Seagate Technology, LLC, 497 F.3d 1360 (Fed. Cir. 2007) (en banc), the court concluded that "generally only evidence regarding the prelitigation landscape of the dispute will be admitted." "It cannot be emphasized enough that the litigation process is a complicated one, comprising multiple steps and moved forward by multiple decisions, ranging from resolving a discovery dispute to a case-dispositive motion. Consequently, I am very uncomfortable with characterizing administrative and court decisions as 'objective evidence' for presentation to a jury."